It was a beautiful Thursday morning and the city was still enjoying the peace and calm before the storm of office going traffic which would soon to hit the roads. It was 8:00 am in Dhaka City and a very special day for the students and faculties of the Economics Department. The AIUB buses were parked and waiting in front of Campus -7, soon to be loaded with excited students and delicious lunch packages from our own Café Shania. The department of Economics had recently launched their BSS in Economics program and in view of enhancing the experience of the students had organized a Study Tour to the Dhaka Export Processing Zone (EPZ) in Savar. The excursion was coordinated by Dr. Akanda After much anticipation the buses finally pulled out of Banani around 9:15 am with the aim to reach the EPZ around 10:30 am to visit the two factories that we had scheduled appointments with. M/S. Dada (Savar) Ltd. and M/S. Sungnam Textile Mills Ltd., a concern of Young One Group. The drive via Ashulia was one of the highlights of the tour because it allowed us to refresh our senses with the beautiful green scenery of paddy fields and trees coupled with the sparkling waters of the Turag river. We were saddened to see the innumerable smoke stacks of the brick fields which were belching grey smoke and polluting the environment, but nothing could get in the way of the students’ enthusiasm that sang songs and cracked jokes all along the way. On arrival we were cordially greeted by the GM himself Md. Ashraful Kabir, who seated us in a nice air conditioned auditorium and screened a video about the EPZ which was very informative. Many of us had never entered the EPZ before and were very excited to have the privilege to experience the operations of the factories within. 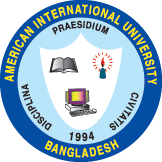 And it was indeed a privilege because we later learnt that AIUB is the first University that has been granted permission to enter and tour the Dhaka EPZ. Later we were given light refreshments in the board room where we observed various EPZ products on display from caps to jackets and even latex masks for costumes. We had to drive up to the first factory, M/S Dada, which doesn’t mean ‘grandfather’ as we would have assumed, but rather it is a Korean word which means ‘The more the Better’ as was explained by the factory manager. This was a Cap or headgear factory making numerous types of baseball caps for brand names like Nike and Tommy Hilfiger. We saw the cutting section, the fabric storage facilities, the washing and dying setup, the stitching section and the embroidery unit of the factory. The factory had a larger operation prior to 9/11, and some sections were visibly closed down. We were impressed to see that the factory also had a day care center, water treatment plant, cafeteria, and health center for its employees. The second factory belonged to Young One group, one of the largest Foreign Direct Investment (FDI) in Bangladesh by the Koreans. Again we were cordially greeted by the Manager and his team. This factory was producing synthetic textiles for jacket linings. The yarn is imported and then it is spun and weaved and finally transformed in to synthetic fabric. It is actually quite a complicated and technical process which is more capital intensive compared to other factories. Most of the work was being done by noisy machines with a few supervisors. We were divided in to three groups and shown around the factory and it was topped off by light refreshments and soft drinks provided by Young One. Throughout the trip the students were asking intelligent questions wherever they went and leaving an overall good impression about their University. We learnt that the Chairman of Young One owns two private jets which stay here in Bangladesh as well as a flying club with around seven aircrafts. It was an extremely hot day and by now we were worried if our lunch packets had gotten spoilt. We bid farewell to the EPZ and made our way to Jahangirnagar University (JU) to have lunch at the canteen there, courtesy of Shawkat Sir, before we headed back to AIUB. It had been a thoroughly enjoyable and informative study tour and as we drove back exhausted we were already thinking of where to go next.